A few months back, I stumbled upon a Kuwait website that sold various health and beauty products and being the curious girl that I am, I decided to order some. One of the product that I ended up ordering was Yoko Spa Milk Salt that is orginally made in Thailand. What the product promises to do is leave skin smooth and silky to the touch, help with discoloration, as well as remove dead skin. OMG!!!! A product that actually does what it promises! First off, the smell of the product is good, nothing fancy or exciting but does not smell bad either. Second, the salt looks yellow-white in color. The way you use it is by wetting the area you want to place the salt on. Once the area is wet, put the salt on the area and rub it in a circular motion for a period of three minutes. After the three minutes are over, rinse the salt off. Your skin is instantly smooth and silky! What's so great about this product is that over time, it also improves the color of areas that may be different in color then your normal body. For example like your knees, elbows, armpits, or even the inner thighs near the bikini area tend to be slightly darker then your natural skin tone. This product helps with that problem and I can't recommend it enough! It's my FAVORITE salt product for my body and I have been using it on my friends ever since I got my hands on it. Each and every single one of my friend went crazy about it and they went and got it too. It's so popular in Kuwait and Iraq, and I am sure it'll be a craze here as well. I LOVE LOVE LOVE this stuff! I also love the little cow on the cover, so cute! 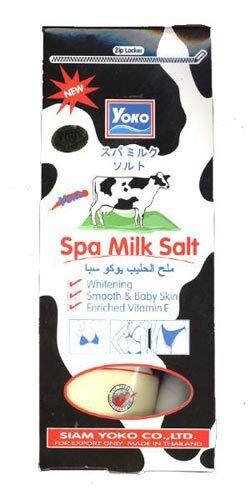 Have you tried Yoko Spa Milk Salt? What do you think of it? I just bought this because you recommended it and I can't believe how soft it makes the body. Shukrun Alia, you are wonderful. I am glad you liked it Reem! It is such a great product that is affordable and the ingredients are simple. I love that! !